This pack of 32 cards are a great tool to review and challenge students for the Common Core Standard! 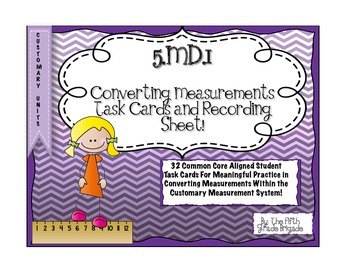 CCSS.Math.Content.5.MD.A.1 Convert among different-sized standard measurement units within a given measurement system (e.g., convert 5 cm to 0.05 m), and use these conversions in solving multi-step, real world problems. This pack reviews the customary measurement system. Just print on cardstock or laminate, and you can place these on a binder ring. 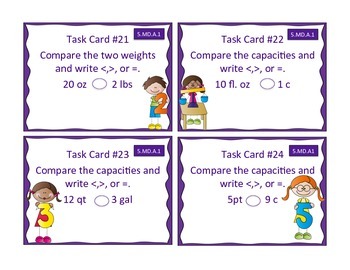 Use these task cards in centers, during a fun game of SCOOT or even for independent practice! Allow students to complete the recording sheet and the answer sheet is provided for the teacher’s convenience!